The Twin Cities Breakfast Club Blog: How Do You Solve A Problem Like Maria? One family's never-ending search for decent hash browns, good eggs, and a sufficient amount of half and half. Luckily Maria's Cafe doesn't have any real problems, I just needed to come up with a witty title to this post. This was not our first trip to Maria's, but it has been a very long time since our last visit. We clearly were due for a visit as any twin cities breakfast review site worth its salt should be able to discuss Maria's and their world famous cachapas venezolanas (corn pancakes). It had been so long since our last trip that when cousin Perley ordered a meal that consisted of nothing but meat and eggs, our served told us about this great new healthy way to diet where you just eat protein and stay away from carbohydrates. The good Dr. Judy waited until he walked away and then intoned, "Yeah, really healthy, until your kidneys fail and then you die." It was a slightly depleted breakfast club that walked into Maria's around 10 am on Saturday. Fern was slaving away in the service industry and my suggestion to leave an empty space at the table in her memory was voted down. There was one positive to this development however, as it meant we could all pile into one car without forcing someone to hunker down in the way back of the station wagon. Alex drove and admirably showed off her newly honed manual transmission skills (reverse is still a little tricky). Maria's immediately earned a solid check in the positive column. Here it was, 10 am on a Saturday the restaurant was packed, and yet we were seated after waiting a mere two minutes. Maria's is absolutely massive. There are three different rooms, all very large. Ample seating for everyone! The dining experience at Maria's was tremendous. The group sampled from across the menu, Rachael and Judy both had the daily special, one scrambled egg, black beans, sausage, arepa, and sauteed sweet plantains. They both gave it an A, but could have split one and had more then enough to eat. Jimmy had the standard breakfast and would have given it an A, but the potatoes tasted as though they had been frozen at one point, so it received a B. I had an egg sandwich and it was tasty, but I gave the meal a B due to the lack of coffee refills (I am WAY too demanding on that front, I know). Alex got one corn pancake (with cheese) and a side of sausage, gave it an A, but was only able to eat half of her meal. The corn pancake is tasty, but extremely filling. Overall grade of the meal was a B+. The TCBC highly recommends Maria's Cafe. We did agree however that it does not make the cut as an "old standard". The food is great, but very heavy and not the sort of thing you can eat everyday Saturday, unless of course you plan on weighing 350 pounds in six months. 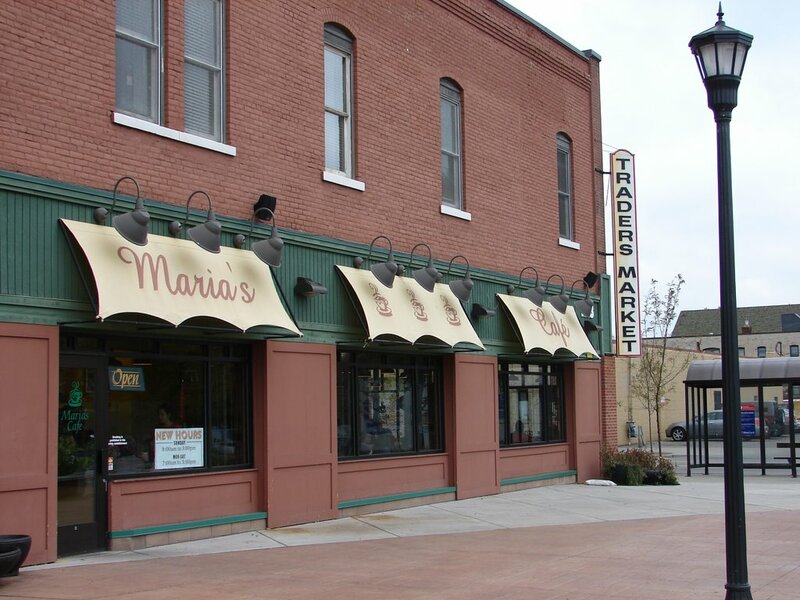 We will return to Maria's, but it won't be next week. I really liked the green onions and tomatos sauteed with the maduros - great combination of sweet and savory. You can get your sausage as links or patties. You can have it how you like it. Thanks, Maria. One plantain pancake and a little pot of hot tea -- perfect. My favorite breakfast date.